My mother recently joked about an experience I had in maine a few years back, so I figured I would share the memory here. My wife and I were on a new england vacation, and had stopped in Cape Porpoise in Kennebunkport Maine to look around at several shops and I also wanted to do some photography. While there my wife got the brilliant idea to do a whale watch, but the idea of going 25 miles out to sea in a small boat was not my idea of fun,but since it was clear blue skies and totally calm seas, I said sure. We headed out and kept going and going and going, and about halfway out it gets cloudy, and I thought no big deal. When we are nearing the whale area, the captain comes on the loud-speaker to say conditions look like they are going to deteriorate and we wont be staying long. Well things did deteriorate rapidly and just as my wife tries to shoot a whale coming out of the water, I grab her to tell her how horrible I am feeling,and she basically says go get sick somewhere else so I can enjoy the whales. Anyway, the waves were rolling now at 6-8ft and the whole way back in, the captain literally was riding the waves with his boat till we crashed into waves ahead of us. I was certain we were going to be lost in this storm, and because I was sick, we sat on the outside of the boat as everyone huddled inside with life preservers on. The two parts of this trip that are the most indelibly etched in my mind are when I went inside to use the bathroom, everyone was watching me head to the door, and as I open the door, this poor woman is standing there with her clothes around her ankles and the whole crowd looking at her. I thought who lets a door unlocked in that state? The second memory is of these two teenage girls who stood on the very top of the boat in the front and screamed with utter joy as we crashed into each wave. I thought we were dead and they were having the time of their lives, so I guess it’s all in your perspective. Needless to say whale watches are no longer high on my to do list. I remember getting to shore and hearing a crew member say, the captain told them it was the worst conditions he had ever navigated, but I am not sure what that meant since he was only about 25 years old. This photo was taken that day, but its nothing earth shattering. Several people who know me have commented that they enjoy my light painting photos, but want to see more of my nature and scenic photography, so I will appease them with a shot I did in Acadia National Park one fall morning. I really love traveling to the New England states in autumn, because the landscapes and quaint villages make for some terrific possibilities. Many times in the past I have made the trek to Vermont and New Hampshire, only to find a nasty batch of bad weather has destroyed most of the fall color, or I am slightly early or late. After suffering through that situation several times, I started to have a back up plan each trip, and that turned out to be the great state of Maine. The beauty of Maine is the fact that even if the color is a flop, you can hit places like Acadia National Park, which is really quite spectacular. 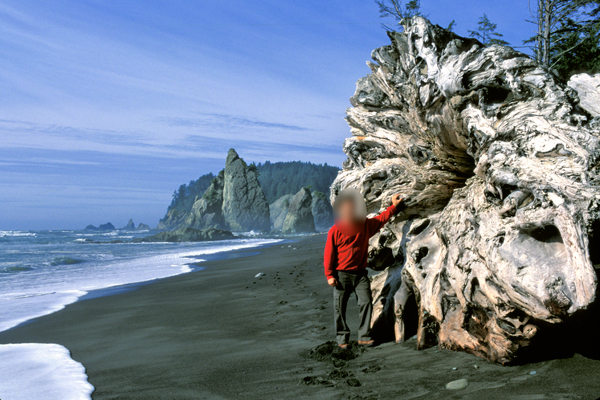 It features a rugged rock lined coast, lovely pines, crashing surf and more. The title of my post refers to the fact that I headed to this mountaintop overlook Four days in a row, and on the very last day I was rewarded with this sunrise. This view is from Cadillac mountain in Acadia, which is the highest point along the atlantic seaboard and the first place you can see the sunrise in the United States. Each day before this one was full of nasty winds, rain, thick fog,etc, but this day awoke to the ocean being covered in a spectacular wave of rolling fog. The Sun made an appearance and provided the finishing touch to the scene. All the mornings of getting up an hour and a half before dawn for nothing great, were soon forgotten as I took in the awesome scene before me. A few tidbits of info for anyone contemplating visiting Acadia or anywhere along the coast of maine. First take plenty of high-capacity memory cards, wake early and see things that 99 percent of tourists miss by sleeping in. Next, if you are one that likes to get unique perspectives, be aware that if you fall in the surf or get washed out in Maine, chances are fairly good that you are finished. 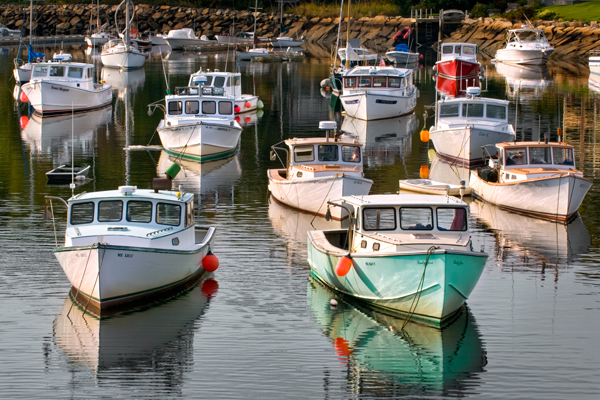 Maine pretty much figures if you are brave or stupid enough to be pulled in, that’s your problem. I basically like that view and will tell two simple stories of my escapades in Maine. 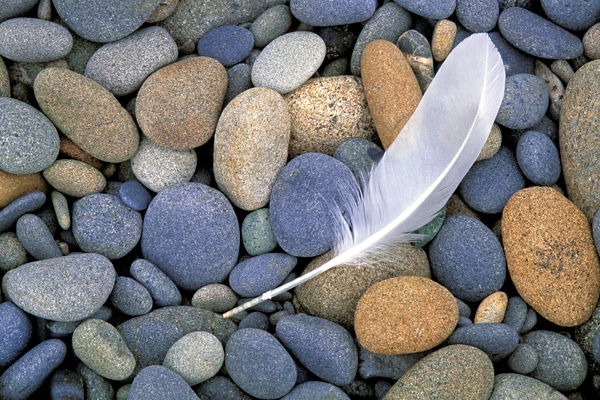 The first is from a trip I took to Acadia years ago, and as I was working the rocky coast, I made my way along a ledge that lead to a small cove of rocks that was almost ten feet high by about twenty feet wide. I was dazzled by the crashing surf on the rocks below,which were at least 8 feet below me,and even though I knew the tide was coming in, I was oblivious to that fact. After about thirty minutes of shooting, I noticed the ledge I came in on, was now under two feet of water. If you ever had a scare where you feel your heart racing, then you know what I felt at that moment. My only possible way out was to climb the sheer walls in this cove, and I did that by using my Gitzo tripod,which is very strong,and I literally stood on it to reach the top. All this while The surf was spraying me occasionally and getting closer. It was a real eye opener, because had The surf got me, that would have been all she wrote. My next memory of Maine involves a trip to the Portland Headlight, which in my view is a very gorgeous lighthouse. Anyway, as usual,they have a fence to kind of keep you off the rocks, but again, if you are after that special image, you most certainly feel the call to jump that fence. I have ventured into this usually very safe landscape of granite many times, and gotten great images over the years. On this particular trip I was somewhat close to the ocean, but I was standing on a mountain of a rock that no kidding was at least 25 feet high and 20 feet square.This rock was far enough and high enough from the crashing surf that the incoming waves were only just nipping at the rock next to mine. To get a clear picture, imagine you are on a 25 foot high rock and there is a two foot gap to the next rock and you can look down and see surf at the bottom. wave after wave mildly washed around the bottom few feet of these house sized monsters. As I was looking through the viewfinder, I hear a thunderous crash and look up to see the entire rock next to mine covered, the 25 ft deep crevasse filled with water and water washing up to my ankles. If you have never heard the term, rogue wave, familiarize yourself with it, before hitting Maine. Those memories are forever etched in my mind because of the intensity of the experience. Okay, one more funny one,to me anyway. I was photographing at the pemaquid lighthouse one fall morning. There was only one other guy there shooting. I said hi and noticed a small sticker on his tripod that said John Shaw. I asked why he had a John Shaw sticker and he said well, it’s because I am John Shaw. 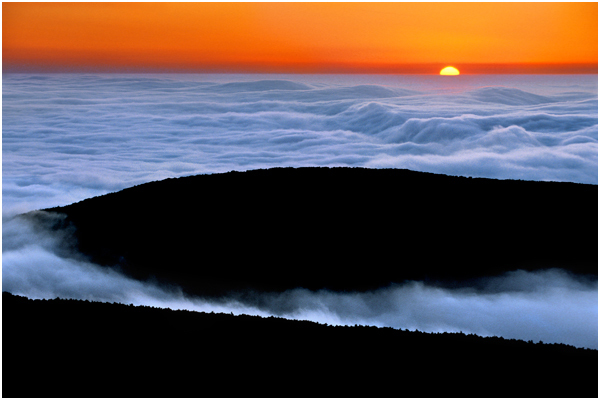 For anyone who does not know him, he is a fairly well-known nature photographer who has published numerous books. I had all his books, but in person, he looked different than I remembered. He was very cordial, left me load a roll of 220 velvia slide film in his fuji panoramic camera and shoot a series with it. I was dazzled by the meeting and even had my wife snap our picture together. 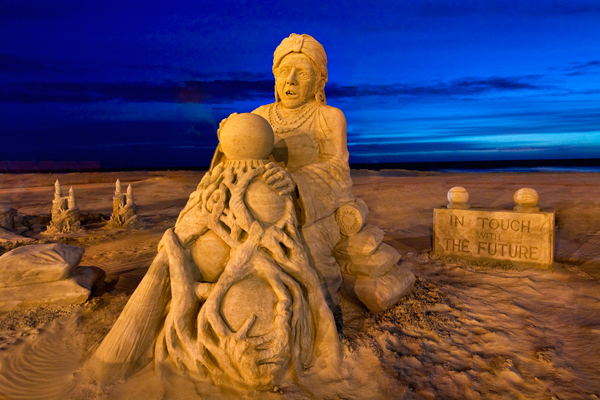 With temperatures climbing past 60 degrees today, I started to reminisce about a couple of images from the Virginia Beach Neptune Festival a few years ago. 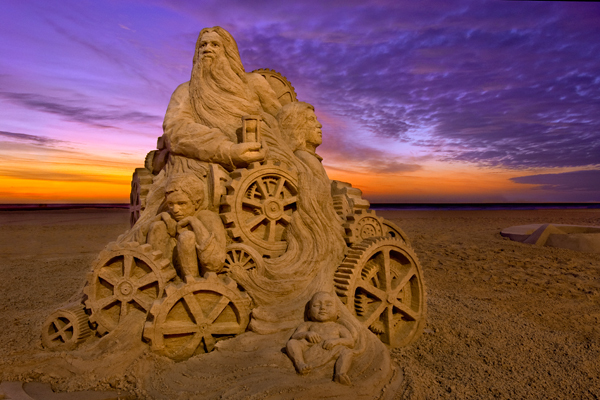 Art comes in many forms and I am always amazed what these sand sculptors create with several million grains of sand. These are good examples of getting up before the rest of the world to get images others rarely see. Now I can only hope for a good arctic blast to set everything back on its proper course, and maybe get some snow sculptures instead. This sweet little scene is just one small portion of a grand gingerbread creation done by RLPS Architects in Lancaster,Pa. 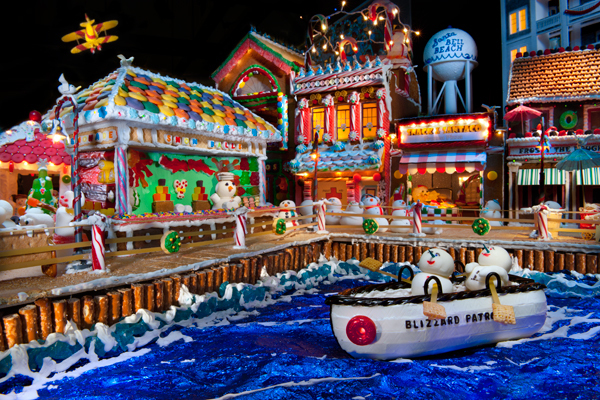 Every year near Christmas, the employees create a very unique gingerbread village and then they open their doors on select evenings for the community to enjoy. 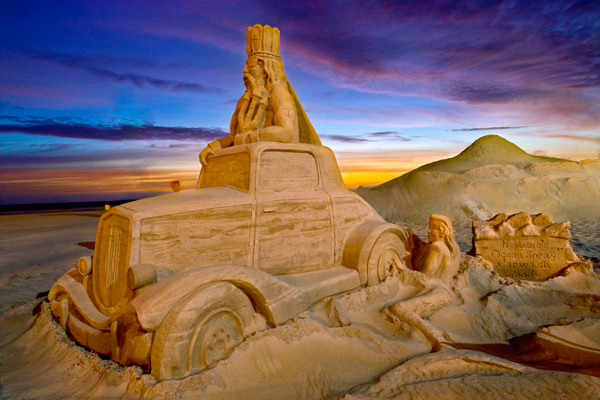 This year featured a beach theme,and was simply amazing.